Kempinski Hotel Cathedral Square is located in the center of Vilnius Old Town, a UNESCO World Heritage Site. It is right on the Cathedral Square, and easily accessible to all tourists attractions within walking distance. Vilnius is soulful, charming, fragile, and marked by impressive Gothic, Renaissance, and Baroque architecture. The city is set at the junction of three cultures – Central, Northern, and Eastern Europe, making it a true gem of the Baltic countries. Guests at the Kempinski Hotel Cathedral Square can indulge in the finest collection of 96 luxury guestrooms and suites, or dine on local flavors and superior cuisine at the best restaurants in Vilnius, Telegrafas and Bar Le Salon. Hosts can organize an ideal conference or meeting at the state-of-the art conference center, covering 600 square meters and divided into five conference rooms. 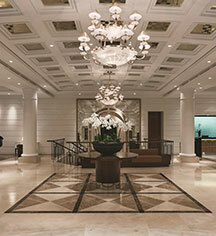 And visitors can relax in the pleasures of the fully appointed spa and wellness center, Kempinski The Spa. Kempinski Hotel Cathedral Square, a member of Historic Hotels Worldwide since 2016, dates back to 1900. The Kempinski Hotel Cathedral Square building was erected on a site where, according to legend, the Grand Dukes were cremated according to pagan rituals and a perpetual fire was burnt in the honor of the Baltic God of Thunder, Perkūnas. Cancellation Policy: Cancellations must be made before 16:00 hotel time one day prior to arrival. Extra Person Fees: Extra-person charges may apply and vary depending on the age of the person: child/adult. Please contact hotel. Payment: All forms of payment are accepted. Visa, MasterCard, and Amex are accepted. 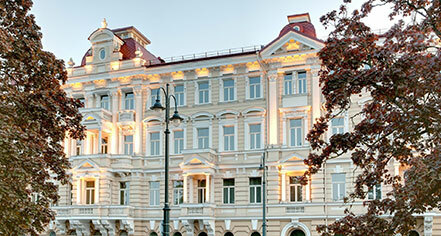 Kempinski Hotel Cathedral Square is located in the center of Vilnius Old Town, a UNESCO World Heritage Site. It is right on the Cathedral Square, and easily accessible to all tourists attractions within walking distance. Vilnius is soulful, charming, fragile, and marked by impressive Gothic, Renaissance, and Baroque architecture. Learn more about the History of Kempinski Hotel Cathedral Square .